2017 is quickly coming to an end and what a year it’s been! We’ve won over some amazing new clients, revisited sites we’ve worked on in the past and welcomed some new faces to our talented team. Now we’re looking back at some of the biggest trends which have graced the digital world this year. Although still dominated by the gaming industry, 2017 has proved that VR and 360° videos can be an impressive tool for web design. Providing users with the opportunity to explore and interact with virtual images and videos has been a hit within many different markets. Soon the days of reluctantly booking a hotel in case the photos don’t quite match the reality will be long gone. Users will be able to wander around hotel grounds as they please in their own VR. Not quite sure if a product you’re looking at online will look the same when it arrives? The use of 360° images and videos let you scrutinise every inch before you buy. Pretty cool, huh? We’ve managed to feature some attractive 360° shots for a few of our clients now, most recently for equestrian brush-ware company Renwick & Sons. The popularity of VR is sure to increase in 2018 and will open up an influx of opportunities in web design. Watch this space! Security has continued to be a major hot topic in web design. Due to the advanced intelligence and capabilities of hackers, websites need to stay on top of the latest security ‘must haves’ to ensure site safety and reputation are obtained. Earlier in the year, Google decided to intervene and implement some new security changes. They announced that any site which didn’t own a valid SSL certificate would be flagged as unsafe upon entry. This helps users identify a potential risk, but also has serious implications for any sites which might be flagged. You can read more about this on our blog post. We’ve already been in touch with our lovely existing clients about this, but we understand it can be difficult to keep up-to-date with the latest trends and security necessities! Existing client or not, if you’d like to discuss how we can help please get in touch. Data methods are advancing year by year and 2017 has been no different. It’s becoming increasingly vital that we understand our users and data applications have needed to develop new ways to cope with this demand. Advanced analytics, behaviour analysis and data capture are just a few of some of the statistics that can help us get a closer insight into the user journey. With advanced programmes helping us produce attractive and in-depth charts, graphs and heat maps, more people are beginning to understand the importance of these analytics in web design. We’ve generated some great results for clients this year. Please feel free to talk to us on how we could do the same for you in 2018. We’ve been warned that robots will eventually take over and it’s slowly starting to happen! Google and Facebook were two of the tech biggies to incorporate AI into cool features like facial recognition, but this year saw the likes of LinkedIn among many to join the bot bandwagon. You may have also noticed that a lot of companies are using chat bots as a tool to communicate with customers across social media. Using AI can help improve accuracy, consistency and efficiency, so it’s no wonder it’s thriving within web design. Although a nice tool to have, there’s still a while to go until personalised enough to take over human interaction completely. Perhaps we’ll see some developments on the use of this in the coming year. We can’t wait to see what will be trending in 2018. Progression with micro-moments, increasingly humane chat bots and new visual depths to dynamic scrolling are just a few things we’ve heard on the digital grapevine. Exciting things are coming! We’ll be closing after Friday 22nd December for Christmas celebrations and will return on Tuesday January 2nd. 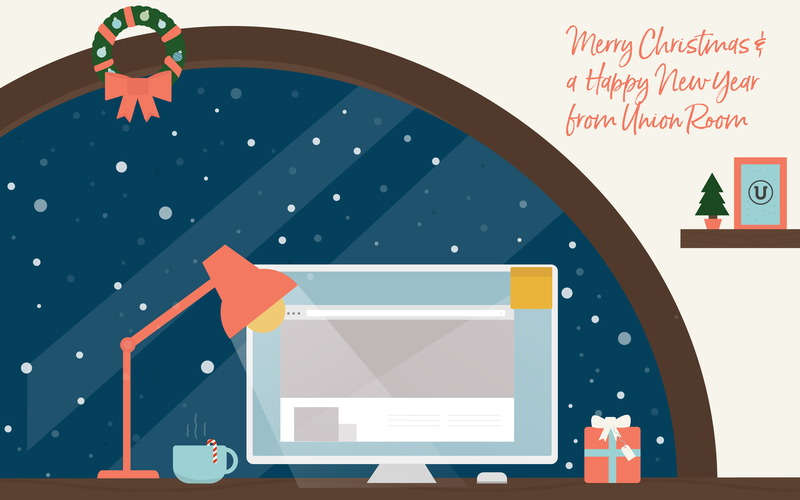 So, all of us at Union Room would like to wish you a very Merry Christmas and Happy New Year. Thank you for all of your support and here’s to another great year ahead!